Morgan Lucas was fastest in Top Fuel qualifying Friday at Maple Grove. Morgan Lucas and Hector Arana continued on hot streaks, pacing the Toyo Tires NHRA Nationals Top Fuel and Pro Stock Motorcycle fields, respectively. Joining the duo atop the sheets were Ashley Force Hood (Funny Car) and Mike Edwards (Pro Stock). Lucas and Arana were winners a week ago at Brainerd, Minn.
Only one session of qualifying was held as rain descended upon Maple Grove Raceway. Lucas’ team picked up right where they left off days ago in Brainerd, driving to a 3.867 for the No. 1 spot on the ladder. Larry Dixon is second, nearly two-hundredths behind Lucas with a 3.89. Points leader Antron Brown sits third with a 3.895, and Cory McClenathan is fourth with a 3.903. Rookie-of-the-year contenders Spencer Massey and Shawn Langdon are next on the sheets with respective runs of 3.920 and 3.933. Joe Hartley and Doug Foley, who is making his first appearance of 2009, round out the top eight. Tony Schumacher is the final driver seeded in the field after posting a 12th-best 4.047. Sixteen drivers are in Reading, meaning all will be part of the field, but Brandon Bernstein, Doug Kalitta, Dave Grubnic, and Chris Karamesines will enter Saturday not qualified. Though much of the discussion leading into qualifying centered on teammates John Force and Robert Hight, Ashley Force Hood stole the spotlight in qualifying, piloting her Castrol-backed Mustang to a 4.114 to grab the provisional No. 1 spot with two sessions remaining. Force Hood’s teammate Hight, who swapped cars with Force for this event and the Mac Tools U.S. Nationals presented by Lucas Oil, adapted well to his new surroundings, nabbing the second position with a 4.137. Bob Tasca III sits third with a 4.138, and a trio of drivers in the battle for the final spots in the Countdown to 1 field — Cruz Pedregon, Force, and Matt Hagan — are next on the sheets with runs ranging from 4.159 to 4.174. Jerry Toliver finished in the all-important 12th spot with a 4.289. Seventeen drivers are attempting to make the field, meaning five drivers enter Saturday not in the field. 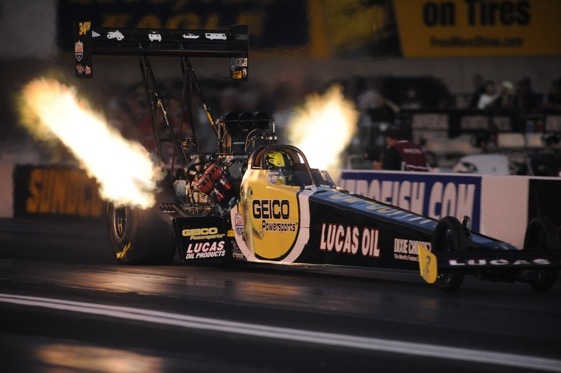 Surprisingly, Tim Wilkerson and Ron Capps both struggled and will enter Saturday needing to break into the field. Also not qualified at this point are Gary Densham, Justin Schriefer, and Jeff Arend. There were no big surprises in Pro Stock where Edwards is once again leading the pack. Edwards wheeled his ART/Young Life Pontiac to a 6.640 to grab the top spot heading into Saturday’s final two sessions. Edwards holds a nearly four-hundredths edge over the rest of the field. Brainerd champ Greg Anderson is second with a 6.679, and Warren Johnson, who has qualified in the bottom half the last four events, is on pace for his best Sunday start of the season, sitting third with a 6.680. Jason Line is fourth with a 6.689, followed by Greg Stanfield, Ronnie Humphrey, Rodger Brogdon, and Kurt Johnson. Rickie Jones’ 6.742 anchors the provisional 12-car field. Allen Johnson is surprisingly among the racers who did not break the top 12 in Friday’s session. In fact, the Mopar-backed driver is last on the sheets after his car went into tire shake at the hit, forcing him off the throttle. Perennial qualifiers V. Gaines and Johnny Gray area also among the nine drivers who will be battling to break into the field on Saturday. Arana continued his dominant showing in the Pro Stock Motorcycle class, once again outpacing the field by a good size margin to grab the provisional pole. Arana clocked the lone six-second run of Friday’s lone session, a 6.986, to park his Lucas Oil-backed Buell No. 1. Arana’s run was nearly four-hundredths ahead of second-place Michael Phillips, who finished with a 7.020. Karen Stoffer, a consistent high qualifier this season, is third on the sheets with a 7.023. Eddie Krawiec is fourth, and last week’s runner-up Junior Pippin sits fifth. Rookie-of-the-year contender Doug Horne, Shawn Gann, and Andrew Hines round out the provisional quick eight. Bailey Whitaker occupies the 12th and final transfer spot with a 7.258.